The Aermacchi MB-339 is an Italian military jet trainer and light attack aircraft. It was developed as a replacement for the earlier MB-326. In September 1972, Aermacchi was awarded a contract to study a replacement for the Italian Air Force's MB-326s, comparing seven all-new designs (given the designation MB-338) powered by various engines with an improved version of the MB-326, designated the MB-339. The MB-339 was considered to meet the Italian Air Forces requirements while being cheaper than the all-new designs which resulted in it being selected to replace both the MB-326 and the Fiat G.91T in Italian service. The MB-339 is of conventional configuration and all-metal construction, and shares much of the 326's airframe. It has a low, un-swept wing with tip tanks and jet intakes in the roots, tricycle undercarriage, and accommodation for the student and instructor in tandem. The most significant revision was a redesign of the forward fuselage to raise the instructor's seat to allow visibility over and past the student pilot's head. The aircraft was fitted with a larger fin and powerplant for the initial versions was the same Rolls-Royce Viper 632-43, producing 4,000 lbf (17.8 kN), as fitted to the MB-326-K. 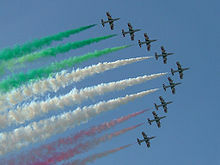 The first flight took place on 12 August 1976 and deliveries to the Italian Air Force commenced in 1979. It was still in production in 2004 in an enhanced version with a much-modernised cockpit. Over 200 MB-339s have been built, with roughly half of them going to the Italian Air Force. The Lockheed-Aermacchi MB-339 T-Bird II was a losing contender in the USA's Joint Primary Aircraft Training System (JPATS) aircraft selection. Among the seven to enter, the Raytheon/Pilatus entry won, which became the T-6 Texan II. According to an article posted on the Italian website 'Il Porto Franco', called 'Armi e finanziamenti nel corno d'Africa', Eritrea paid about $US 50 million for six MB-339 CEs in 1997. This is the original MB-339 with more advanced avionics for the ground attack role, RWR, uprated Viper 680-43 engine, and larger wingtip tanks. It is capable of carrying Sidewinder AAMs, AGM-65 Maverick AGMs, and laser-guided bombs. Unit price of the MB-339C would have to be somewhere around $US 8.3 million dollars in 1997. The Argentine Naval Aviation (Comando de Aviación Naval or COAN) was the first foreign user of the forerunner MB-326GB, buying eight in 1969. In 1980, the COAN ordered ten MB-339As advanced trainer and light attack aircraft. These were delivered in 1981 and were operated by the III Escuadra Naval 's 1 Escuadrilla de Ataque. During the Falklands War, late in April 1982, six of them were located at Port Stanley Airport, renamed Base Aérea Militar (BAM) Malvinas. 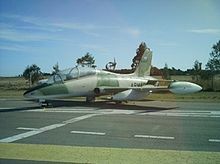 They were the only attack jets to operate from the Falklands, along with four Beech T-34 Turbo-Mentor light attack and trainer aircraft, and twenty-four turboprop FMA IA 58 Pucará light attack aircraft of Grupo 3 de Ataque. Other Aermacchis operated from three mainland bases, at Almirante Zar, Bahía Blanca, and Río Grande, Tierra del Fuego naval air stations. During tensions between Eritrea and Ethiopia in the late 1990s, Eritrea started to rebuild its air force. In 1996, the Eritreans ordered six Aermacchi MB-339CEs, with which the first combat unit of the ERAF was founded in 1997. They have proved their worth as training aircraft and even during the early fighting in 1998. Their initial deployment started on 5 June 1998 (the same day in which the ETAF also started its operations). During the same afternoon, the Ethiopians reported two attacks of Eritrean MB.339FDs on the city of Mekelle, the capital of the Ethiopian region of Tigray. Reportedly, as many as 44 civilians were killed and 135 injured. However, on 6 June one of the MB-339s was shot down north of Mekelle. The pilot ejected and was either rescued by a Mi-8 of the ERAF or was captured by local militia. The surviving Eritrean Aermacchis were deployed again on the next day during the fighting around Erde Mattios. On the morning of 12 June 1998, two Eritrean Mi-8 appeared in low level over Addis Pharmaceutical works, in Adigrat, attempting to bomb it. Their weapons, however, fell a few yards from the plant and caused only minor damage. Only a couple of hours later, four MB.339s rocketed and cluster-bombed against several targets in the city as well. According to Ethiopian sources four people died and 30 other were injured during those attacks. On 5 February 1999 the Ethiopian government claimed that two Eritrean MB.339FDs attacked a fuel depot in Adigrat, some 48 kilometres inside the Ethiopian border, important for the supply of the Ethiopian army with fuel. Original production variant for Italy. 107 were delivered in three batches 1979–1995 (including MB-339PANs and MB-339RMs. In addition, four delivered to Ghana and five to Dubai. Variant for Frecce Tricolori aerobatic team., adding smoke generator but removing tip tanks 21 new build or converted from MB-339A. Radio and radar calibration variant for Italian Air Force. Three built in 1981 but later converted to MB.339A standard. MB-339A version built for Malaysia. 13 built, with deliveries from 1983. MB-339A version built for Nigeria. Twelve built from June 1984. MB-339A version built for Peru. Sixteen built and delivered from November 1981. Single-seat dedicated attack version, first flew 30 May 1980. One built. Trainer with more powerful (4,400 lbf (19.57 kN)) Viper 680-43 engine. One example built. Revised trainer version with new, digital avionics. MB-339C for Italy, with modernised flight controls and avionics, but retaining original 4,000 lbf (17.79 kW) Viper 632-43 of MB-339A. 30 built. MB-339C version built for Eritrea powered by Viper 680-43. Six built. 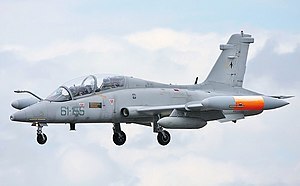 MB-339C version being built for Malaysia. Version for U.S. JPATS competition, with 4,000 lbf Viper 680-582. Eritrean Air Force operates 5 MB-339CE. Italian Air Force operates 72 MB-339A and 30 MB-339CD. United Arab Emirates Air Force operates 10 MB-339NAT (inc. 4 ex-Italian). Dubai Air Wing operated 7 MB-339A, 6 modified to MB-339NAT. Royal Malaysian Air Force operated 7 MB-339CM (15 Squadron). Peruvian Air Force operated 14 MB-339AP, now stored. Nigerian Air Force operated 12 MB-339AN, now stored. Rockets: pods for Zuni or SNEB unguided rockets. ^ Air International June 1978, p. 276. ^ Air International June 1978, pp. 276, 310–311. ^ a b Chant 2001, p.35. ^ Ethell and Price 1983, p.108. ^ "List of Argentine Aircraft Destroyed". Retrieved 8 November 2009. ^ "List of Argentine Aircraft Destroyed". Archived from the original on 29 May 2009. Retrieved 22 June 2009. ^ "Eritrea orders six MB-339 trainers" Flight Global, 27 March 1996. Retrieved: 14 January 2014. ^ a b c Jackson 2003, pp. 276–278. ^ a b c d Jackson 2003, p. 278. ^ a b c Jackson 2003, p. 276. ^ Braybrook 1992, p. 143. ^ a b c Jackson 2003, p. 277. ^ Braybrook 1992, pp. 143–144. ^ Wright 1992, p. 251. ^ Jackson 2003, pp. 277–278. Braybrook, Roy. "Aermacchi MB-339C". Air International, September 1992, Vol. 43, No. 3. pp. 137–144. Chant, Christopher. Air War in the Falklands 1982. Oxford, UK, Osprey Combat Aircraft 28, 2001. ISBN 978-1-84176-293-7. Ethell, Jeffrey and Alfred Price. Air War South Atlantic.London: Sidgwick & Jackson, 1983. ISBN 978-0-283-99035-9. "Initial Malaysian MB-339CMs Delivered". Air International, April 2009, Vol.76, No. 4. p. 7. Jackson, Paul. Jane's All The World's Aircraft 2003–2004. Coulsdon, UK: Jane's Information Group, 2003. ISBN 978-0-7106-2537-3. "Mentor with a pedigree: Aeronautica Macchi's MB-339". Air International, June 1978, Vol. 14 no. 6. pp. 267–276, 310–311. Taylor, John W.R. (ed.) Jane's All The World's Aircraft 1980–81. London: Jane's Publishing. ISBN 978-0-7106-0705-8. Wright, Matthew. "Not all black for the winged Kiwis". Air International, May 1992, Vol. 42, No. 5. pp. 249–257. Wikimedia Commons has media related to Aermacchi MB-339.